Do you gift people for praising you in social media? Do you over-deliver to particular customers because of their sizable social media footprint? Should you? While it is not standard operating procedure for many brands, there have been great examples of companies who listen to social media, recognize opportunities to create viral goodwill, and act in very real and immediate ways. Done right, the results of these actions are greater than the sum of their parts. Perhaps the earliest such example that comes to mind was Michael Arrington's April 2008 dustup with Comcast. Upset that his internet service was down, the well-known tech blogger turned to Twitter and started complaining about Comcast. Turns out Comcast was listening. Frank Eliason, a former Comcast executive who is now with Citibank, reached out by phone to find out what he could do to help. The situation pleased Arrington and garnered great media attention. my cat enjoyed the box they came in. Are these authentic signals of gratitude or just good business? Is there a difference? Would Morton's have shown up bearing a delicious steak had the Twitterer not been Peter Shankman, who has 100,000 followers on Twitter and a Klout score of 88? Peter thinks so; he blogged, "I’m a bit of a steak lover... (and) I’ve developed an affinity for Morton’s Steakhouses... I’m a frequent diner, and Morton’s knows it... I think it’s about Morton’s knowing I’m a good customer, who frequents their establishments regularly." Peter suggests that this act of generosity wasn't due to his social media status but his RFM at Morton's. RFM is a broad way of considering the value a specific customer has to a business; it stands for Recency, Frequency and Monetary Value. The more recent a customer's transaction, the more frequent the purchases and the greater the spend, the more value the customer represents to the business. I think Peter is naive (or feigning it) if he thinks Morton's would drive 47 miles roundtrip to deliver a steak to a good customer whose tweet reached just 50 followers. However, I also do not believe that Morton's would have lifted a finger to help Peter if he were not a regular tweeter about steaks and a great customer of the steakhouse chain. It was the combination of Peter's loyalty to Morton's, his social media influence and his instant of need that brought about a serendipitous moment for customer and brand. Real-time customer service that delivers now: Listen constantly. Like any three-legged stool, RFMInow can be wobbly when the three legs do not work in concert. If a brand reaches out with a lavish expression of appreciation to a consumer who lacks a rich, existing relationship with the brand, the result can feel fake and trigger alarms about brand authenticity. An effusive gift to a customer who has little influence cannot produce corresponding viral benefits or ROI. And without the agility to recognize a customer's need and immediately act upon it, the brand misses the chance to rise to the occasion in exactly the right moment. 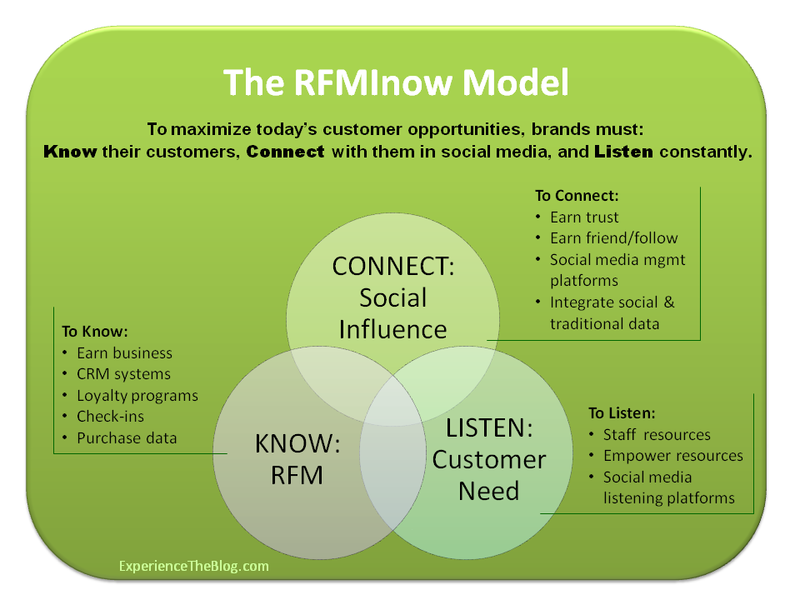 There are challenges to implementing an effective RFMInow model. First, some social media "experts" whine that considering a person's influence makes any action less than authentic, but it's time we mature and appreciate that business needs demand we scale the effort and expense to the potential benefits. Second, care must be taken to avoid violating FTC regulations governing endorsements; any action that creates a material relationship between brand and consumer must be disclosed when the consumer subsequently tells others about the brand. Perhaps the biggest challenge to RFMInow is that it sounds easy but is not, at least not for organizations of even modest scale. To know customers, brands must earn their business, develop ways to collect consumer data, and implement robust CRM systems. To connect to customers, brands must earn their trust, create connections in preferred social media channels, implement powerful social media management programs and integrate all of that social and CRM data. And to listen constantly, brands must have the right empowered employees using the right listening tools to find opportunity and act in the moment. Wheat Thins' thank you gift is an example of RFMInow. As is the case with most consumer packaged brands, Wheat Thins lacks good RFM data on its customers--they can't know how many packages of Wheat Thins I purchase, but they do know I've tweeted and blogged about the brand. (In this case, the low cost of the reward reduces the need for detailed RFM.) The brand recognized that I have moderate influence on Twitter and that other sites aggregate my blog posts. In addition, the brand acted quickly--they asked for my address two days after I posted the blog post and the tasty gift arrived days later. Wheat Thins and Morton's cannot afford to reward every customer for each tweet or post, but the brands can look for the right convergence of RFM, social media influence and moments of opportunity. What are your brand's moments of opportunity--the instant in time when someone tweets about your brand, or the minute one of your customers is in need but hasn't picked up the phone to let you know? Are you aware who your customers are in social media and are you listening? RFMInow will become common for companies within a few years, but at the moment it's RFMIlater for most organizations. Help! Marc Andreessen's Software is Eating our Future! Help! Marc Andreessen has seen the future--and it frightens me. Andreessen got the tech world talking last week with a stirring Wall Street Journal article entitled, "Why Software Is Eating The World." Andreessen, the visionary who co-developed the first widely used web browser and founded Netscape, has a strong vision for the future. "We are in the middle of a dramatic and broad technological and economic shift in which software companies are poised to take over large swathes of the economy," he writes, and that makes him "optimistic about the future growth of the American and world economies." I fear Andreessen is right but also very, very wrong. It's not that I don't share Andreessen's vision of an interconnected world and the power of software; I do! But I fear he (as software gurus are wont to do) focused merely on the technical aspects and not the more vital underlying human, cultural and economic impacts. I have concerns with Andreessen's analysis in ways both small and large. First, I think Andreessen gives short shrift to the importance of the hardware that stores, delivers, runs, displays and transacts his beloved software. After all, if hardware didn't matter, Google wouldn't have just dropped a third of its cash on Motorola, nor would Apple be so obsessed with controlling the entire front-to-end consumer experience. I also believe it is highly debatable that Groupon, Skype and Twitter are, in his words, "high-growth, high-margin, highly defensible businesses." These companies may eventually earn those adjectives, but Groupon lost $103 million in the second quarter of 2011, Skype lost money five of the last six years and Twitter was profitable in 2009 but in the red in 2010. Plus, while Andreessen is quick to promote the success of specific software-driven companies that now are thriving, he seems to have forgotten the many that are gone or struggling--Pets.com, Flooz, eToys, Geocities, Peregrine Systems, Commerce One, Corel, MySpace, AOL, Wesabe, Andreessen's own Netscape and Microsoft (which in the last decade is off 20% while the Arca Technology 100 Index is up 109%), for example. But it is not Andreessen's views on hardware and current valuations that are my greatest concerns; rather, I fear he has not truly considered software's future impact on the economy at large. Nor do I believe he has adequately valued the importance of people, customer service, brands and social media. Reading Andreessen's article, I recalled a vision from Fritz Lang's striking 1927 film, Metropolis, where the managers live luxuriously above ground while the workers toil in horrifying conditions beneath the surface of the planet. Andreessen waxes at length of the wonders of software before breezing past software's sobering implications in a single paragraph. "Many people in the U.S. and around the world lack the education and skills required to participate in the great new companies coming out of the software revolution... (They) will be stranded on the wrong side of software-based disruption and may never be able to work in their fields again." It's difficult for me to match Andreessen's optimism of future economic growth with his acknowledgment that so many will be left behind. Andreessen seems to feel software is a zero sum game--people will lose their jobs, but that's okay (in the end) because "every company I work with is absolutely starved for talent." In Andreessen's vision, it will all balance once we can get a new generation of workers trained for high-tech jobs as "software engineers, managers, marketers and salespeople in Silicon Valley." However, technology isn't zero-sum--as software increases productivity, it replaces those messy, benefits-demanding, sick-day-taking, raise-expecting employees. It is certainly true that today we lack workers with the right skills, but even if every displaced worker had in-demand skills, there still would not (and will not) be enough high-paying jobs to go around. Andreessen's examples demonstrate software's effect on employment. He notes "Amazon is a software company" that was promoting digital books over physical books "while Borders was thrashing in the throes of impending bankruptcy." Borders is going out of business, leaving the 20,000 people they employed at their peak without jobs. Meanwhile, book-printing employment is down from 38,000 to 31,000 over the past decade, and it isn't difficult to imagine most of those jobs disappearing before 2025. And let's not forget the troubles of the independent bookstore--more than 1,000 bookstores closed from 2000 through 2007, leaving about 10,600 unemployed. Where's the Human in Marc Andreessen's Future? Andreessen is correct--software is transforming the world, and it's just getting started. Computers even may replace those jobs you might have thought safe in our digital world. Did you watch IBM's Watson beat Jeopardy's two biggest all-time winners? How might organizations put that same sort of artificial intelligence and computing power to work? Robot journalists? Robot Soldiers? Robot investment managers? What about the jobs of the 2.3 million people in the US employed as customer service representatives? Notes an IBM CTO, "Imagine if you had a system where you just called Watson, asked a question, and you get the answer in real time." Before you object and tell me you'll never have a conversation with a computerized service rep, take a moment to recall that 15 years ago many people mocked the idea that consumers would go online to make their own travel arrangements, apply for mortgages, access their credit card or bank account information, acquire news, watch TV or perform dozens of other online tasks that now are common. If customer service can be automated, why not social media? Imagine tools that respond to customer tweets and posts with instantaneous emotionally and factually correct responses (with no risk of an accidental "F bomb" or sarcastic retort). Today we are waging a battle to make organizations more human, but might we be about to lose that battle to an army of bits and bots? Can interactions in social media be made more human than human? I don't think so, because what Andreessen misses is that software isn't really the differentiating factor that separates the winners from the losers. Every company has adopted software, yet some fail while others succeed. Software may be integral to success nowadays, but no more than great leadership, smart and passionate people, differentiated strategies and brands, human interactions and great customer experiences. Software can replace some human tasks; it can disintermediate distribution channels; and it may someday answer your questions when you call a customer service line. But software cannot compel you to care, make you root for it to succeed, encourage you to aspire to a higher calling, or convince you it has your best interest at heart. Humans, customer service, great experiences and the authenticity of social media are, to me, the antidote to the unfeeling efficiency of software. Am I naive to think that software isn't eating the world and human empathy still matters? Perhaps, but I don't really like where Andreessen's path leads. I'm no Luddite, but I wonder who Marc thinks will pay for those Amazon eBooks, Skype services and ads that power Facebook if software progressively displaces millions out of the workforce. Everything marketers and communicators can do to make people care--about your brand, employees, service and story--helps to make the future a little brighter and a little more human. Two recent studies furnish what seem like contradictory results: One found that 26% of consumers say they have complained about a brand on Twitter while 58% report they've praised; the other study found that 48% of tweets about brands were negative while 16% were positive. It's possible that people's perceptions of their complaint-to-praise ratio are incorrect, or it could be the complainers are very active at complaining. Either way, the message is that organizations must strive to stimulate praise and helpful user-generated content while minimizing reasons for gripes. That should come as no surprise to anyone, which is why it seems odd so few brands acknowledge the praise and help they receive in social media. Social media professionals focus a great deal of attention on influence, sentiment and the authenticity of peer-to-peer communications, so you would think that acknowledging and rewarding people who praise and support our brands would be among our highest priorities. To the contrary, it seems the opposite is true; in social media, the squeaky wheels get the grease while the cogs that are actively driving brand engagement are ignored. I've experienced this firsthand. I've praised restaurants, car dealerships, radio stations, auto brands and other service providers and have rarely received an acknowledgment of any sort. In those rare instances when I've been acknowledged, I can trace my subsequent actions back to the relationship-building responses that I received. For example, several months ago, Bohanan's thanked me for checking in, and I've been back six or seven times since. And two years ago, when I tweeted my love of Bay Area jazz station KCSM, the station's response resulted in me taking a tour of its facilities, tweeting more about the station, and donating around $150 over the next year. For some small businesses, ignoring those who check in, tweet praise or post positive reviews is (barely) excusable because it can be tough to find time to monitor social media; however, acknowledging consumers is an excellent way to create a strong personal connection for a small local brand. For a great case study of a small business driving tremendous success through social media engagement and acknowledgment, check out AJ Bombers, a burger restaurant in Milwaukee. While small businesses may struggle with the time and resources for social media, it is a different story for large organizations with considerable social media resources. Even among large brands, there seems to be focus more on complainers than fans. A month ago, I was stranded in a very hot elevator, and after my release I tweeted, "When trapped in an elevator in San Antonio, you definitely want an AT&T phone and not Sprint. No signal on Sprint; AT&T saved me." Given AT&T's reputation issues with service reliability, you'd think a tweet such as this would be welcomed and appreciated, but I heard nothing. It's not that AT&T isn't present in social media--the company responds to dozens of complaints and service requests each day via @ATTCustomerCare--so why turn a deaf ear to compliments? People who advocate on behalf of your brand or furnish content for your brand deserve acknowledgment. The time has come for smart brands to reward positive, brand-building behavior from anyone who takes the time to share a positive review, a tweet of praise, a recommendation on Facebook or traffic-driving content. 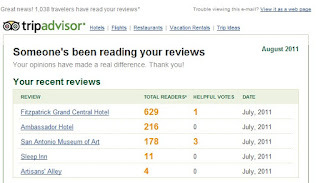 Tripadvisor lets consumers know they have impact: I've praised Tripadvisor before for the way they close the loop with people who complete reviews. This seems the most basic and easy way to reward people who create content--simply make them aware that their content matters. 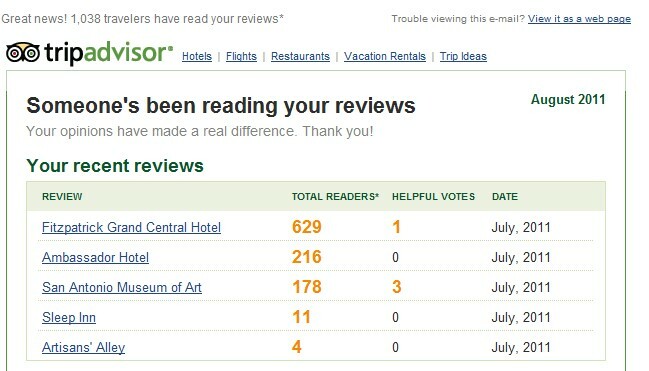 I received an email from Tripadvisor today that informed me over 1,000 people had viewed my recent reviews. This simple notice let me know the time I spent writing the reviews wasn't wasted and brought Tripadvisor top of mind. Yelp does something similar, informing reviewers how many compliments and votes as Useful, Funny, and Cool they receive. While some feedback is better than no feedback, I've never understood these random adjectives. "Useful" is certainly valuable, but why do I need to strive for "Cool" or "Funny" in my reviews? Should I be completing my Yelp reviews with an eye towards being helpful and accurate or instead work in vain to have others perceive me as hip and hilarious? Yelp does a good, but not great, job of closing the loop with reviewers. 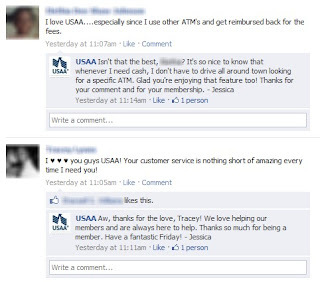 USAA acknowledges all Facebook comments: I'm very proud of the way the community managers on my team at USAA represent the brand on Facebook. 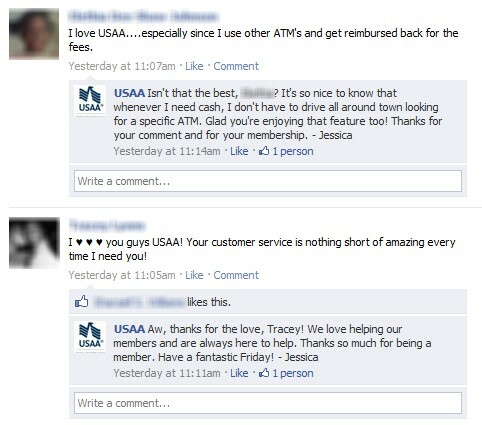 During work hours (and frequently at other times), USAA responds to virtually every Facebook post. We don't simply look for opportunities to offer service to our members when they have problems; we also thank them when they take time to post to their friends their appreciation for USAA's service and products. You wouldn't think this sort of responsiveness would be that earth shattering, but if you survey brands on Facebook, you'll find that consumers who praise do not get the same level of attention as those who carp. What sort of behaviors are we motivating when we leap to respond to each complaint while ignoring compliments? Wheat Thins writes personal thank you notes: Have you ever been thanked by your crackers? Me neither, but Wheat Thins found a way to surprise people in a very personal way: They occasionally write thank you letters to the people who post and tweet about the brand--and it doesn't hurt that they include a box of Wheat Thins as part of the thank you. The result? People post videos like the one below. If you need a brush-up on how to accept compliments, Lifehack has a good article. In short, when you receive praise, be gracious, be appreciative, and when appropriate, involve the person giving the compliment in your success. And when people furnish content that makes your site or Facebook wall a more interesting place, let them know you appreciate it! If someone were to compliment you or offer you a gift in person and you ignored it, that would be considered rude. Why is it so hard for brands to recognize, acknowledge and thank people for their compliments and gifts in social media? As I've observed the hard sell for Google+ among social media professionals, I'm struck with how ill equipped the "experts" may be to evaluate new social media tools and to predict how they will spread into the masses. The problem is that the motivations, needs, wants, goals and experiences of social media pros are vastly different from a typical consumer--your mom, for example. As it turns out, the old adage is correct even in social media: Mother knows best. To be sure, your mother's adoption of a social media tool is likely a lagging indicator; if you wait for most mothers to use a new social media site before you give it consideration, you'll probably already have missed a trend. However, when evaluating new tools, it's vital to focus on your mother's needs rather than the needs of early-adopting, big-name, influence-exerting, social media evangelists. What matters isn't that I, Jeremiah Owyang, or Chris Brogan love Google+ but whether G+ satisfies fundamental needs that your mom has. Google+ is here to stay; in fact, I shared with my social media team at USAA that I expect before the end of the year we will be maintaining a presence and monitoring member needs on Google+, just as we do on Twitter and Facebook. 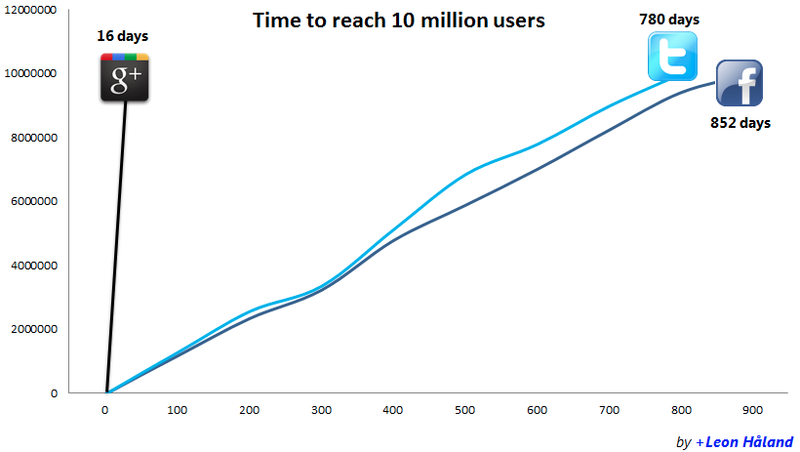 Nevertheless, that doesn't mean I believe Google+ is poised to go mainstream as quickly as some are predicting. Charts like this aren't inaccurate, just wildly misleading. If you listen to some social media experts, you'd think Facebook and Twitter have one foot in the grave and are as old and tired as newspapers and telegrams. 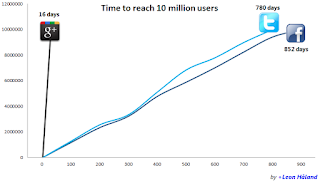 I've been dismayed, for example, that some social media pros are hyping wildly misleading charts that convey how Google+ is growing exponentially faster than Facebook or Twitter. Yes, Google has amassed a lot of users--it is, after all, the most visited site on the Internet--but if registered users are what matters, then MySpace's 180 million members still make it a major force in social media. 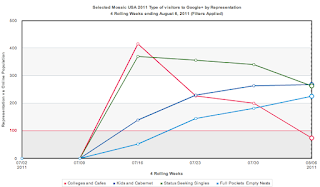 decreasing on G+ while "Kids & Cabernet" are rising. 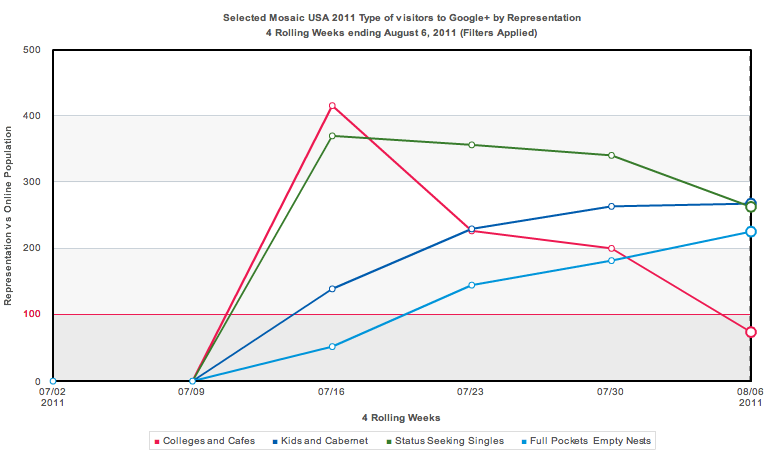 and Experian Hitwise recently noted Google+ is already dropping among the youthful "Colleges and cafes" cohort, a group considered innovators. Says Experian Hitwise, "It's not uncommon for innovators to trial new services online and in some cases abandon those services when they lose interest." Innovators losing interest doesn't sound like a recipe for rapid mass adoption. Social media professionals love the new; moms do not: Social media pros never meet a new site or tool that they don't love; their race to (and in some cases away from) Wave, Sidewiki, Digg, Izea, Triiibes, Hashable, Instagram, Quora, Flipbook and the like has been dizzying. Your mom is different--she simply isn't as interested in the new. She doesn't want to learn sparks, streams, circles and hangouts, and she doesn't have the time or patience to recreate her social graph in another tool. Facebook is just fine, thank you--it does everything it is supposed to by helping her keep in touch with her kids, high school friends and coworkers. For G+ to pull mom away from Facebook, Google's going to have to offer a lot more than Google+ currently does. Social media professionals want more influence; moms do not: To social media pros, influence is a currency as real and desired as gold (even at $1,742 per ounce). They track it in Klout, trade it in Empire Avenue, and monitor it on the Ad Age Power 150. The barest hint that a new social tool may catch on is enough to send social media pros racing to establish a presence; heaven forbid someone get there first and amass a larger audience! But your mom has all the influence she needs and couldn't care less about the size of her social graph. She doesn't have any desire to be seen as an early adopter, and unless and until a significant portion of her friends (and not just her crazy early-adopting son or daughter) shifts to G+, your mom won't either. Social media professionals travel in packs; moms do not: Do you know what it takes for Robert Scoble or Chris Brogan to build a healthy network in a new social network? They show up. These two well-known speakers and bloggers have large networks who want to stay connected, so when Scoble promotes his Google profile on his site and Brogan shuts down his Facebook profile with an "I have moved to G+" message, they can be assured a vibrant community will quickly develop on their new preferred social venue. But what happens when your mom tries to change social networks? Do all her siblings, her high school swim team and the members of her PTA group immediately follow in order to keep in touch? It's a very different (and much lonelier) experience for the average consumer to join a new social network. A mass shift may never occur from Facebook to Google+, but that is what it will take for most moms to change their social media habits. Social media pros hate Facebook; moms do not: I've never quite understood the level of disdain the people who make their livelihood from social media consulting have for the world's premier social network. The reason most often cited is that Facebook often violates users' privacy, but the list of entities that make money selling customer data is a huge one that encompasses credit card providers (though not USAA), cell phone services, cable TV, online ad networks, GPS device makers, supermarkets and even physicians. There is no doubt that Facebook has a vast image problem that it would be wise to take seriously, but mom simply doesn't share the same animus toward Facebook that is common among libertarian, open-source-loving, terms-and-conditions-reading early adopters. The irony of social media professionals leaping from Facebook to Google+ is that there is no indication Google will be any more open than is Facebook--after all, Google didn't become an $182-billion company by open-sourcing search and mobile platforms. Google+ will be important; it will be necessary; and eventually it may even become a true mass social medium; however, that will only happen when moms start making the switch and not just tech and social media professionals. I simply don't foresee that happening any time soon, no matter what some breathless chart of adoption statistics shows. It is said that good judgment comes from experience, and a lot of that could have been avoided if we had listened to our moms. It's time for social media pros to listen a little more to their mothers and a little less to each other. Asynchronous Transparency: Are Consumers & Brands Playing by the Same Social Media Rules? The social era is celebrated for bringing a new level of transparency to communications between companies and customers, but has it really? Without doubt, companies are being forced to embrace greater transparency with consumers, but are consumers returning the favor? Or are we in an era of asynchronous transparency--a one-way mirror where consumers demand brand openness and honesty while giving somewhat less of themselves? During the mass media era, brands that could afford it enjoyed a cozy relationship with the limited and exclusive channels of mass communication. This was a time of opaque and sometimes misleading communications, with some brands abusing their power. Cigarettes were healthy, soda pop was good for infants, Lysol was a safe feminine hygiene and birth control product, magazine "seals of approval" were bought rather than earned, DDT was the benefactor of all humanity, and deep, dark tans saved people from the unhealthy horror of natural, pale flesh. Consumers of past generations had little leverage to encourage transparency on the part of large brands; instead, this power was wielded by the government and professional organizations. For example, after decades of misuse, the American Medical Association debunked Lysol's safety as a birth control method and the FTC cracked down on magazines selling commendation seals. Today, consumers possess substantially greater power thanks to the democratization of media. Anyone can launch a blog, a YouTube video or a wall post within a brand's Facebook page. While any single consumer complaint may go unheard or unanswered, there are an overabundance of examples of companies forced to face the music based on the actions of a few empowered consumers. Companies such as Delta, Nestle, GoDaddy, United, Motrin, Gap, Tropicana, Maytag, California Milk Processor Board, Marriott, National Pork Board and Groupon have had to address, defend, apologize for and change practices as a result of protests launched from social media, and this list is just the tiniest tip of the iceberg. A social media manager had to defend his bank against claims of account hacking made by a woman who said erroneous withdrawals were repeatedly being made. The bank determined a former boyfriend was responsible, but the woman continued to post accusations in an apparent attempt to shame the bank into reimbursing what her boyfriend had stolen. My peer was frustrated because the consumer felt free to lob many false claims and garner emotional support from others while the financial institution had its hands tied--it was bound by privacy rules to keep the facts of the situation private. A consumer packaged brand faced an ugly incident when a consumer emailed an image of a cockroach found in a box of snacks and threatened to post it on social channels unless a settlement was offered. The company put the social media team on alert to watch for mentions while it investigated the claim. Eventually, evidence was found that proved the claim fraudulent, but the social media team had already wasted a great many hours planning an unnecessary emergency response. One person attending the conference was ashamed that a friend leveraged his considerable Klout score to scam a new cell phone. Weeks after purchasing a phone, the friend dropped it in a toilet, killing the device. Rather than admit he was at fault, the friend tweeted how the phone was a "piece of sh!t," and soon was offered a replacement at no cost. Is this the transparency we envisioned? One friend noted that consumers regularly make mistakes when posting gripes on his brand's Facebook page, such as mixing up his brand's products for a competitor's and failing to follow necessary assembly instructions. Mistakes will happen--we're all human, right? But are brands given the same leeway to make honest mistakes? In one well-known case, an employee made the horrifying but predictable error of posting a crude tweet to Chrysler's Twitter profile rather than his personal account; not only did the employee lose his job but Chrysler showed the agency the door. Should an entire organization have to pay for an understandable split-second mistake of a single employee? I'm not trying to play the victim card on behalf of "the man"--brands still possess a lot of might in paid, owned and earned media--but can we really embrace social media transparency in only one direction? If a former employee has the right to blast a company in Twitter for mistreatment, does that company have the same right to reveal the employee's performance and discipline history? If a consumer can report every perceived slight or insult when dealing with a company's customer service representatives, can the brand report every vulgar tirade or threat made by the consumer on those same calls? If you read this blog, you know that I am as aware as anyone of the new reality of brand-consumer relationships, but I wonder about the implications of this transparency imbalance. Might brands begin to seek the same transparency demanded by consumers; for example, when a consumer posts a service issue to a public channel such as Facebook, is it feasible for the company to secure permission to publicly share customer and incident particulars that formerly would have been kept secret? Or might some brands throw up their hands in disgust and abandon certain sorts of service and response via social channels, frustrated that consumers can initiate any claim in public channels while demanding brands keep the particulars of their situations private? Is social media fated to be a channel of asynchronous transparency, or will brands and consumers share equal rights and obligations in the future? Your thoughts, opinions, criticisms and stories are welcome--please comment below!